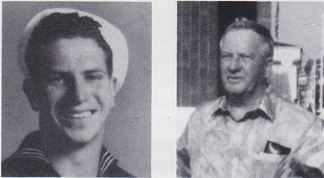 Richard H. "Bud" Robinson, Seaman l/c, born in Grafton, WV in 1923, the same year the ship was commissioned. He entered the service June 2, 1943, and was stationed at Great Lakes. From there, he was sent to PSNY Bremerton, WA. One of his duties there was chipping paint in the double bottom of the ship while being rebuilt. He was on the shakedown cruise from Bremerton and remained on the ship until his discharge Feb. 14, 1946. He and his wife, Peggy, live in Grafton, WV. Within a radius of 30 miles of Grafton, the mast is located at Morgantown on the campus of WVU; another smaller staff is at Clarksburg; and the secondary steering wheel is at Salem College in Salem. Robinson and Peggy are the parents of two children, Joshua Enoch and Melissa Ann. There are two grandchildren by Josh, Tiffany Ann and Joshua Steven. Since retirement, Bud spends his time growing flowers and enjoying the children.